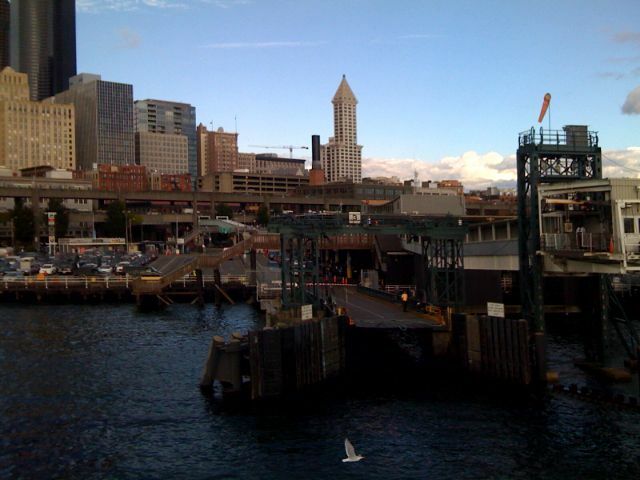 In my opinion the best cheap entertainment in Seattle is the ferry that runs between downtown Seattle and Bainbridge Island. For $6.70 per adult (kids under 6 free) you get a roundtrip ride with great views of Puget Sound, the houses on Bainbridge, and the downtown skyline. And on sunny days you get a great view of Mt. Rainier as well. I particularly enjoy the view of Smith Tower (the one with the pyramid on the top) on the return leg; Kate and I got married in the Chinese Room up top.